The cleverly hidden cocaine keeps Santa going all night long. 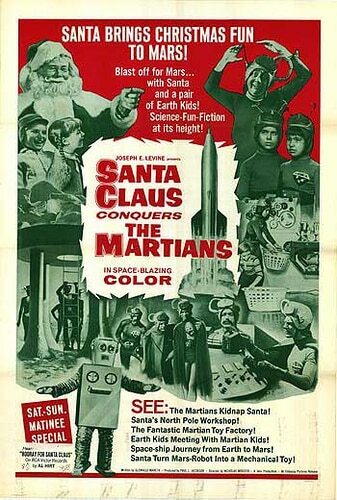 There’s a movie that was made in 1959 about a big fat guy in a red suit named Santa Claus. Every year he brings presents to all the good little children around the world. So far so good, yes? Well, not if you’re talking about the Mexican Santa Claus movie, which was featured on Mystery Science Theater 3000 (where they correctly observed that the film was “good old fashioned nightmare fuel”). 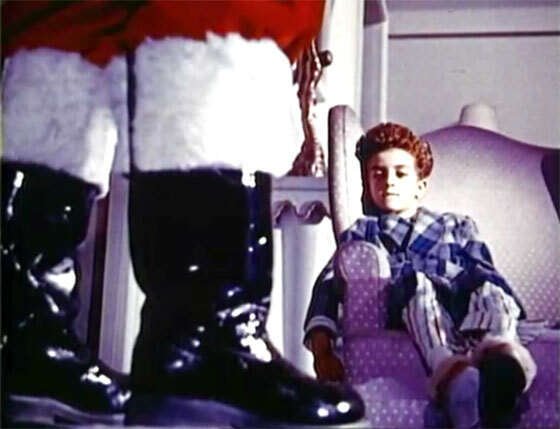 Directed by René Cardona, a guy from Mexico City who also did some wrestling movies, Santa Claus 1959 concerns a slave-driving Santa (José Elías Moreno) who lives up in the sky and has a whole sweatshop army of little kids doing his work for him. I guess the Union of Elves went on strike. Yeah, folks. 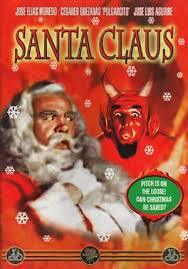 This is actually in the movie, Santa not being a fan of political correctness. 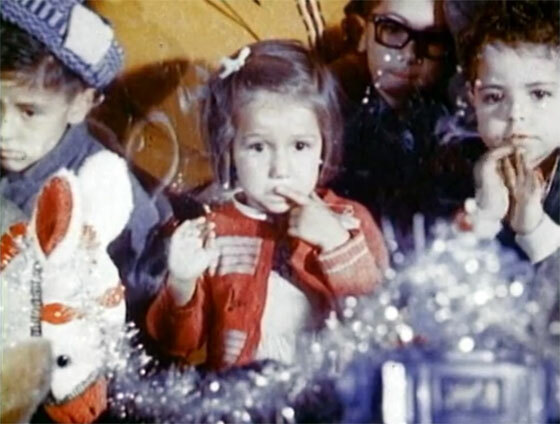 As we begin the movie, Santa gets on the piano and bangs away like a fat, white-bearded Liberace as children from other countries dance around in the most stereotypical fashion possible. 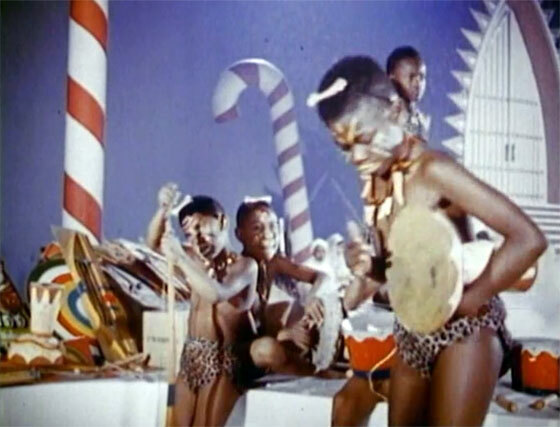 When children from Africa don native gear and jump around to drums, you’ll want to hide in your bed and cry and hope Santa skips your chimney. After what seems like an eternity of untalented kids singing, we meet Pitch, a devil (from hell!) 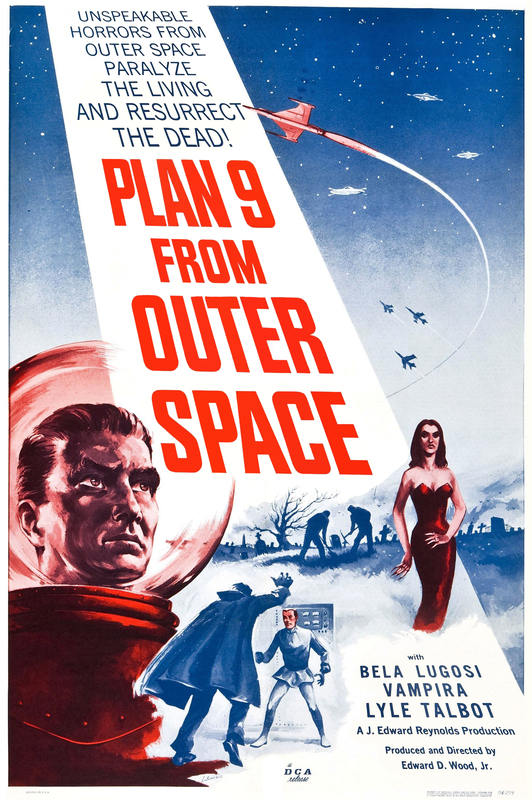 who is sent up to Earth to screw up Santa’s Christmas plans. Oh, did I mention that Pitch (played by José Luis Aguirre ‘Trotsky’) likes to dance around alot? He’s a bit light on the loafers, if you know what I mean. I’m evil, I’m carefree, I’m gay! I was born this way! Anyway, Pitch is nothing compared to the horror that is fascist Santa! In the observatory, we are told all the cool toys Santa has at his disposal so he can spy on all the kids on earth! The earscope! 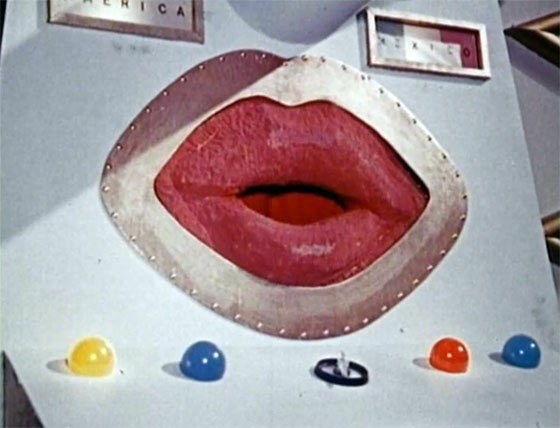 The tele-talker that knows everything! The cosmic telescope! 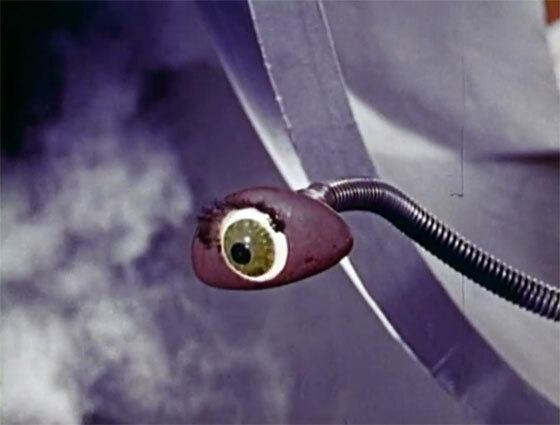 The master eye! Homeland Security has nothing on Santa. Santa’s palace is what the world would have been like if Hitler won WW2. See the earscope? 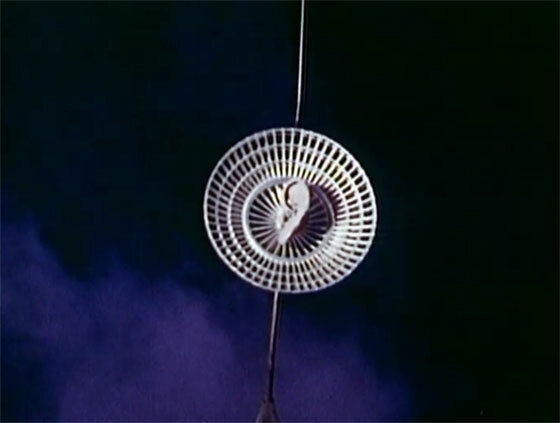 It’s a fan with an ear on it. 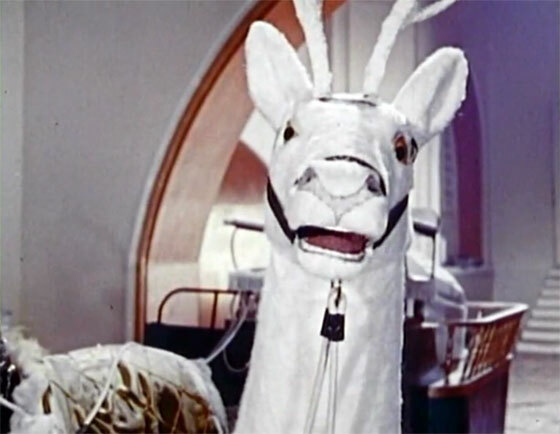 And Santa’s reindeer are actually wind-up reindeer who can emit creepy, menacing laughter that would frighten just about anyone, not just little children. Yes, somebody has been eating too much peyote. Santa doesn’t just have a group of kids at his disposal. His slave labor also includes Merlin the Wizard. Yes, Merlin – and he’s quite absent minded, as the always-perturbed narrator tells you. 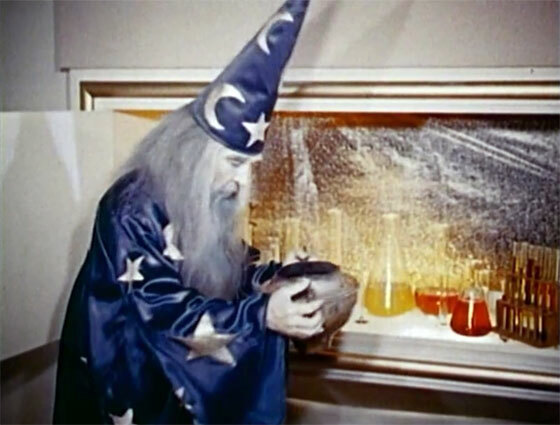 Merlin makes all sorts of stuff for Santa in his lab, like the “flower-to-disappear” or the “dreaming powder that fills everyone with joy and goodwill.” It takes an ungodly amount of time for Merlin to mix his chemicals together, since he’s so forgetful. 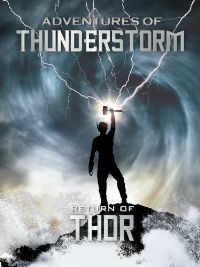 (And the urn he uses to mix his chemicals is partly composed of Uranium and Plutonium). He also hops around and makes silly sounds while he does it. When Santa gets what he came for, he tells Merlin “See you next year.” (One half-hour with Merlin a year is all Santa can stand). 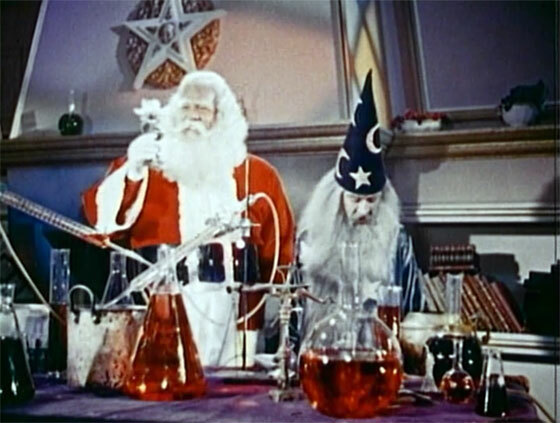 To keep Santa’s operation going, Merlin helps synthesize heroin from a special poppy only grown in the sky workshop. Then Santa visits the key-maker, who makes a special key that can magically open all the doors in the world. 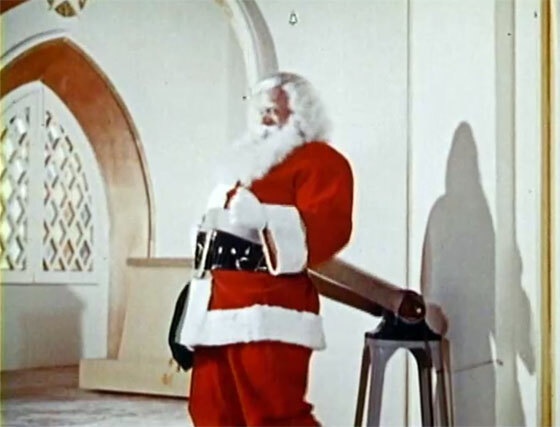 After that, Santa hits the vibrating belt machine so he can get down all the chimneys. Then the child helpers get his reindeer sleigh ready – Santa comments that while he has no problem using spaceships for “interplanetary flights” he has no intentions of converting “his white reindeer into sputniks.” The narrator chimes in: “Maybe a Sputnik would be faster, but I can’t quite imagine Santa Claus without his reindeer and his sleigh, can you?” Yeah, communist tech is not allowed anywhere near Santa’s sky headquarters, thank God! 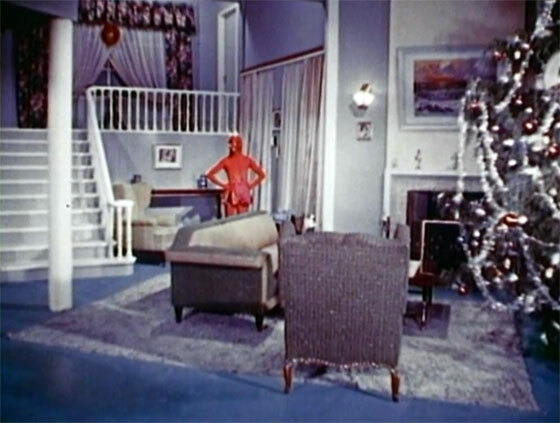 I’ll tell you what’s evil, sister… their home decorator! Mmmhmm! Santa also teaches a Pilates class in the summers. Once we escape the Orwellian Klaus stronghold, we meet Lupita, a cute little girl who lives in a poor family. There’s one particular doll that she really wants for Christmas but mommy can’t afford it. Pitch appears to her and tries to get her to steal it. 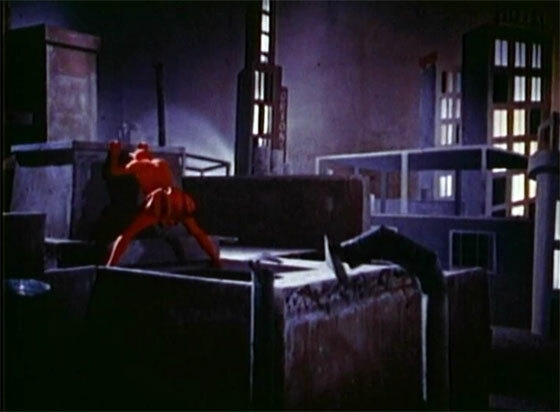 Pitch’s arrival is always signaled with an off-key piano note. (I’m sure that won’t get old). We meet another kid who lives with a rich family but just wants his parents to stick around for Christmas – at least for 5 minutes, before leaving him home by himself while they go out and drink martinis. Santa and Pitch will battle for Lupita’s soul. Pitch manages to influence a trio of bad kids, but since both they and Pitch are completely incompetent, it’s nothing for Santa or anybody else to worry about. Of course, Santa ain’t exactly a pro, either. 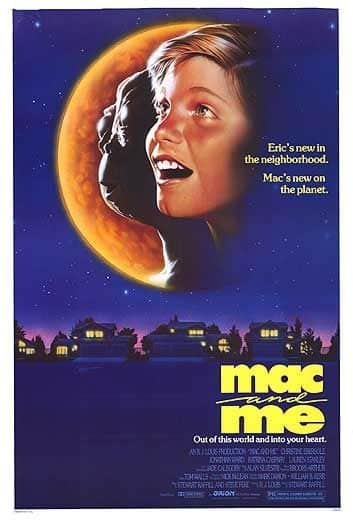 Millions of kids around the planet, only one night to visit them all, and he spends most of his time in a handful of houses fighting off the devil. Not every efficient, Santa, especially with a kid army at his command. What is it they do all day? And why hasn’t Santa been arrested for violating child labor laws? Pitch is an evil demon. The first thing he does is move a chimney so Santa can’t get down it. Completely evil! Then he blows on a doorknob until it turns red hot! Menacing! 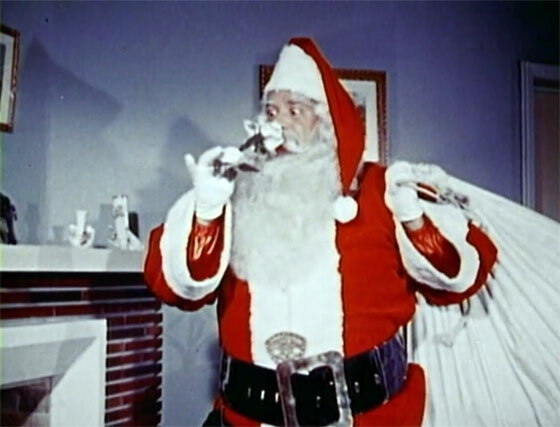 In his defense, Pitch does manage to inconvenience Santa by stealing his sleeping powder and flower-to-disappear. Then Santa gets chased up a tree by a mad dog! It’s up to Santa’s friend Merlin the Wizard to help save the day, and hence, Christmas. Merlin also makes a mean martini. The movie ends with Lupita getting her doll, the rich boy’s parents returning home, Pitch getting sent back to hell for more dance lessons, and millions of the world’s other children going Santa-less for the year. Come to think of it, if you wanted to, you could see Santa’s organization as a metaphor for the US government – they can see and hear everything you do, but they’re so inept that nobody really benefits from it. Or you could just pass Santa Claus off as a really silly holiday movie from Mexico made by a guy with serious psychological issues. Yeah, that’s your best bet. The future is Santa’s boot stomping on a kid’s face… forever! 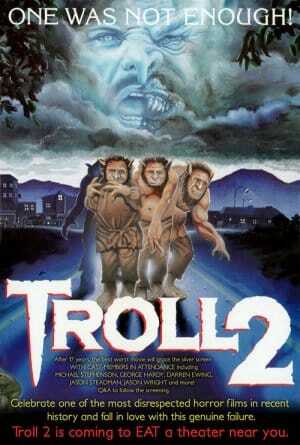 I loved this movie when I was younger! Only the one I had didn’t have a devil it was the same movie /actors/plot but no devil…did they make two versions?? ?